We teleport inside the Storm Giant lair known as the Maelstrom, and immediately discover all the shortcuts. I felt the minutes tick by slowly, furtively glancing toward both the staircase and the pool of water. Korinn returned first, still invisible. She reported that an entire delegation of Giants sat upstairs in some sort of concert or show, hosted by the Storm Giants. It wasn’t the kind of party we wanted to crash. While we debated on how to handle it, the pool of water began rippling. A gigantic shark head emerged, crashing into the side, sending a water-logged T.I.M. sailing through the air. We finally journeyed into the Maelstrom, the primary lair of the Storm Giants, via the teleporting conch shell we had grabbed from the Cloud Giants. Then we did what we always do: split the party and skip through the dungeon. We were met with what appeared to be a lobby area, with a few hotel-like rooms, and a very violent sauna with an erupting geyser. Only one obvious path lay before us: a staircase up where we heard voices and music. T.I.M., however, jumped into a large pool of water and proceeded to sink 40 feet. He was the perfect one to explore the depths – was a Warforged he didn’t have to breath, and his Flux Plate was currently set to make him immune to the constant crushing damage. T.I.M. spotted an underwater tunnel at the bottom. 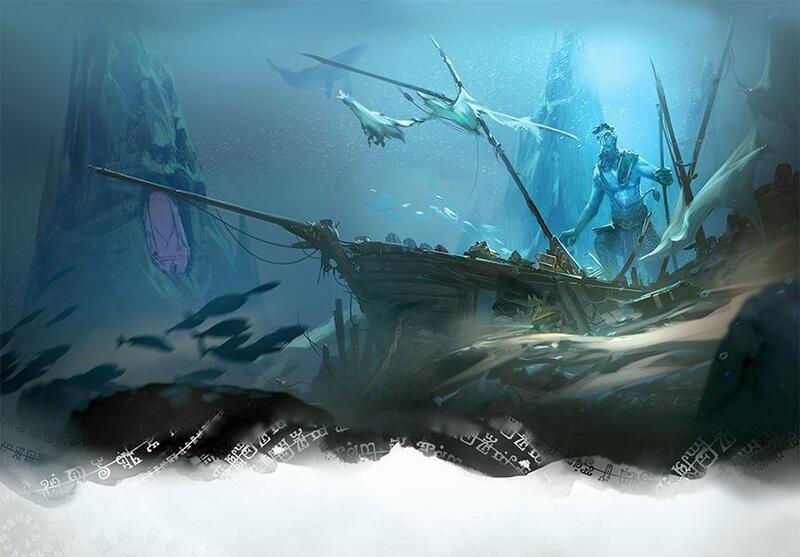 Bryseis decided to join him by Polymorphing into a Giant Shark, and the two disappeared through the tunnel, just as Kazin was throwing a rope down to save T.I.M. They reached an underwater portcullis, which T.I.M. blasted apart with his Blasting Hammer. From there the tunnel opened up into a huge central chamber filed with all manner of sea life. The chamber was dominated by a large grate and whirlpool in the middle, seemingly leading to further depths in the ocean, while additional gated tunnels lie in each of the corners. After attempting to make friends with a Giant Seahorse, the unlikely pair chose a random tunnel, blasted it apart, and emerged into a treasure room, guarded by a pair of giant crabs. T.I.M. used Action Surge to deploy back-to-back Blasting Hammer attacks (“that thing was a mistake!” -DM), destroying the crabs in a single round. He proceeded to loot the room, which included some really tasty loot like a Flame Tongue and Cloak of the Displacer Beast. Not wanting to go too far without the rest of the party, they returned to the lobby entrance. In the mean time the rest of us had explored the simply lobby area, and Korinn used Invisibility to explore upstairs. She found a pair of Storm Giants playing music and singing to a summit of other Giant leaders. We were a bit intimidated by so many Giants in one room, none of which would be terribly pleased to see us. When T.I.M. and Bryseis the Shark emerged from the water, T.I.M. spilled all the treasure on the floor like a proud child who won a carnival prize, and we knew which path we were going to take. 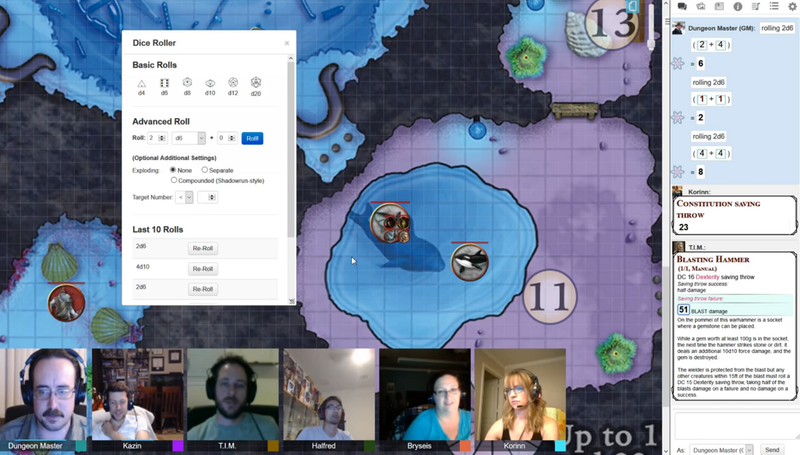 Despite Korinn’s protests, we all jumped onto Bryseis the Shark and let her lead us down into the tunnel. 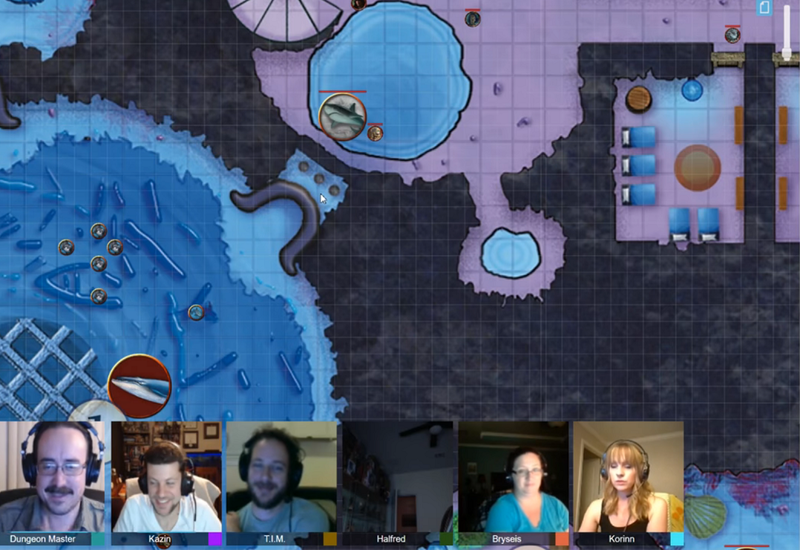 Korinn missed taking a breath, but thankfully make every single CON saving throw to avoid drowning, and the crushing damage was minuscule. Bryseis the Shark randomly picked the tunnel to the southeast. Kazin and T.I.M. attempted to lift it the old fashioned way, and failed miserably. Nervous about using too much precious time underwater, T.I.M. again employed his Blasting Hammer to blow it apart (using about 500gp in gems so far). We swam through and emerged into another underwater pool, this one home to a killer whale. The whale immediately saw the invading giant shark as a threat, and we were forced to engage. Both T.I.M. and Halfred moved to attack, with Halfred able to wrap a bola arrow around it even underwater. Kazin grabbed the nearly-suffocating Korinn and swam to the surface, while the whale simply retreated out the way we came. We climbed out of the water and Bryseis de-sharked. The southeastern chamber held three exits, a door to the north, stairs leading down to a small shallow pool in the east, and stairs leading up to the south. The stairs east held a sleeping Storm Giant; presumably it was his bedroom, or maybe just a resting area. Brysesis checked a nearby giant sea anemone with her Mage Hand only to find a bunch of dead fish. We opted for the staircase. About halfway up T.I.M. noticed a recessed button in the wall, and pushed it. The wall to the north shifted open, revealing a secret passageway into a backroom, with more sea anemones. Despite only finding dead fish in the last one, Bryseis worked her Mage Hand magic on these organic receptacles, finding 1100 platinum pieces in each one. That’s a total of 2200 platinum pieces, or 22,000 gold! Holy hell! That should keep T.I.M.’s Blasting Hammer locked and loaded forever. We were rich as lords and ladies but we still had a mission to rescue a princess. Down the hallway and around a corner we heard Giant voices. Halfred scooted in for a closer look, noticing three thrones, each occupied by a Storm Giant. Somehow, through pure random exploration, we’d made it directly behind the throne room of the royal family. Now it was simply a matter of figuring out how to take advantage of our dumb luck.